The Canon PowerShot S95 addresses virtually all of the issues that detracted from its predecessor - most notably the lack of HD video and sky-high price - whilst further improving the handling and customisation. Current S90 owners won't find too many reasons to upgrade, but the S95 is an even more attractive proposition as a serious compact for serious users. The list of improvements may be relatively small, but they all add up to make the Canon S95 one of the most compelling pocket cameras on the market. It still lacks anything approaching a grip, although the more tactile surface finish that's borrowed from the EOS 7D DSLR does go some way towards aiding handling. The beefed-up shooting mode dial should also answer another common criticism of the original S90. While 720p video should perhaps have already been included on the S95's predecessor, the lack of optical zoom or auto-focus during recording is a disappointment. The new HDR mode is a genuinely useful addition, as are the extra ways to customise the camera almost to your heart's content. Image quality is still excellent, with a usable ISO range of 80-800 and fast f/2.0 maximum aperture, albeit only at the wide-angle lens setting, making the S95 very well-suited to low-light, hand-held photography. It's also possible to capture the blurred backgrounds and sharp subject that most compacts struggle to achieve. Although £399 / €479 / $399.99 is undoubtedly a lot to pay for what is ostensibly a compact camera, putting off most casual browsers, it still offers quite a significant saving on the S90's launch price of £449.00 / €519.00 / $429.99. With street prices already lower, the S95 starts to make much more sense as either a backup to a fully-fledged DSLR or a carry-everywhere pocket camera. 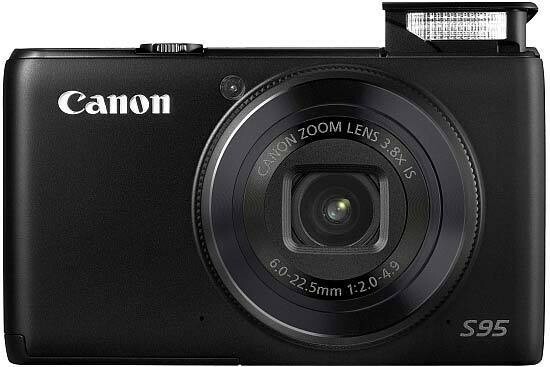 The Canon PowerShot S95 is an easy pick for our Highly Recommended award.